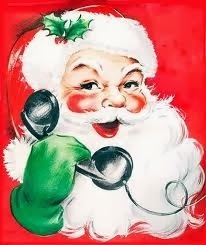 Random Anny .Com: Want Santa's Digits? My niece and I left Santa a two minute voice mail today explaining exactly which Lalaloopsy doll she wants for Christmas. For someone who can't remember what she ate for breakfast she was able to provide an FBI level description for that doll. Spoiler Alert: Its not the one I already bought her. I hope the cookies didn't send Santa into a non-voicemail updating coma!